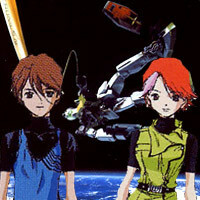 Plot Summary: During the closing days of the Gryps conflict of Mobile Suit Zeta Gundam, two siblings—Asagi and Takuya—ride aboard a civilian transport bound for Earth. Caught in a battle between the Titans and AEUG, they must somehow guide their ship through atmospheric entry. Luckily, they're not completely alone, as they find aid from a custom-painted Zeta Gundam, whose pilot sounds a lot like One Year War ace Amuro Ray. More than just a regular movie, this was actually a combination of animation and CG projected on three screens simultaneously, giving an experience similar to an IMAX/OmniMAX theater.